Religious Exploration – What Does It Mean to Be a People of Trust? Our theme of the month comes from the Soul Matters program. This call to trust Life’s support comes to us as a gift. After all, it’s all too easy to convince ourselves that life is a foe, especially as we enter the second half of winter. So, we need our faith communities to restore our faith that life is ultimately a friend. We need the reassurance. We need to know that when we fall, we can count of being picked up. 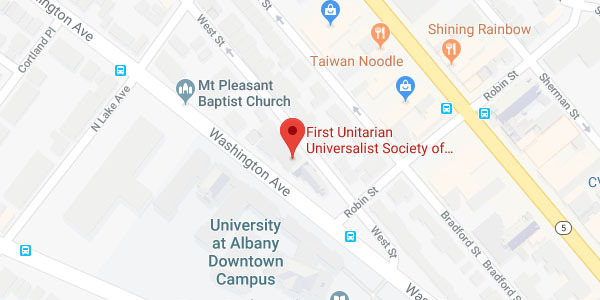 One tangible expression of reassurance we give at Albany UU is sending out HUUGS – Huge UU Greetings to our “fledgling adults”, those recently bridged from our youth group. Mid-winter can be disheartening for anyone, especially if you are on your own on a new adventure – college, the military, service or travel. Even if they are living at home, fledgling adults often miss the community of high school. And Valentine’s Day can be especially painful, with all the commercialized messages out there that every adult should be partnered or have some close relationship. So that’s when a package with goodies from one’s home UU congregation can lift those spirits. Each year, the RE program solicits donations for goodies: packets of soup, noodles, dried fruit, tea, coffee, hot chocolate, etc. And the program is so successful that we already have plenty of donations. Thank you! The high school youth group will be packing the items up in time for delivery before Valentine’s Day. And some of the children’s RE groups will be making valentines to go into the boxes. Our high school youth group is also soliciting donations for “Neighborly Bags”. These are plastic gallon storage bags with items for people often seen on street corners asking for help. The youth are asking you to bring in items like toiletries, feminine sanitary supplies, socks, gloves and hats. At our last Family Chapel, younger children were invited to write notes affirming “you matter” to be included in these bags. Once the youth have a supply of bags ready to go, they will start distributing them during Coffee Hour on a Sunday morning. You can take a few bags to keep in your car so you have them at the ready to give away. Our 8th/9th grade group has been learning about the issues of hunger and homelessness. They have created welcome bags for children and youth at the Equinox shelters. And they are working to make a connection at Joseph’s House and Shelter in Troy. And on March 8th-9th they will be traveling to NYC to participate in the Youth Services Opportunities Program (YSOP). YSOP uses trained facilitators to help groups of youth learn about the issues of hunger and homelessness, provide direct service to people in the community, and integrate their experiences of serving and learning. Through YSOP, our youth will have opportunities to connect with other volunteers and with the people they are serving. The 8th/9th grades are having several fundraisers to pay for their travel to and from NYC and for the YSOP program. The congregation has already been generous with their first bake sale. They raised just over $200. Look for a second bake sale during Coffee Hour – with sweet and savory treats – on February 10th. And for adults, the group leaders for the 8th/9th graders and I are organizing a “Paint ‘N’ Sip” on Saturday, February 23 at 7:00 PM. Nadine Angelotti-Polo will lead us in a group painting lesson and we’ll enjoy some wine and other beverages and snacks – and great company! No art skills required. We’ll supply the art materials and aprons. $40 per person. If you’re not into baked goods or the paint ‘n’ sip, and you’d still like to support the trip and make a donation, let me know at dre@albanyuu.org.